Who’s Curating the Biggest Kanye Collection Of All Time? “M,” a die-hard Kanye fan, wanted to know if there was a place he could read everything West has done since the start of his career. M quickly found the biggest problem with researching a man like Kanye is that so much is written about him on a daily basis; this content isn’t necessarily relevant, and tends to be single-serving knee-jerk reactions to his controversial behaviors. M soon realized that in order to find the content he wanted, he had to start going deeper, using things like Google advance search. Soon, he had over 500 bookmarks, but nowhere to share or organize them. 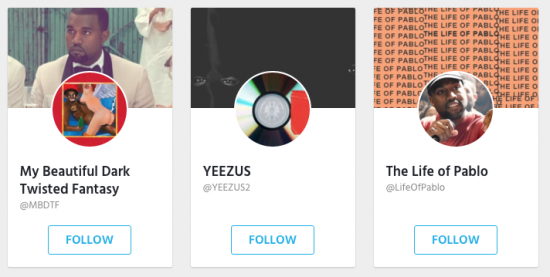 After stumbling across posting platform Wakelet, M is on a mission to curate the most comprehensive library of Kanye West content on the Internet. An everchanging library of content that goes as in-depth as possible into samples, albums, and everything in between, there are no gossip stories here, it’s all about Kanye the creative. How will the collection function? Are users able to directly add to it? As it stands, I’m the sole curator. I like to think I have a good eye for the content that fans want the most. Kanye is one of the most talked-about artists ever – part of my job is to separate the “noise” of the pop-culture sites from the really good content from reputable sources and devoted fans. After the page blew up on Hip-Hop Heads, on Reddit, I was inundated with requests from other fans who wanted to help contribute to the collection. There were also some awesome comments from fans who provided links to content that I hadn’t even seen (I quickly added these links to the collection). I think in the future, as the page grows, we can build a community that helps suggest content and moderate the quality of content that makes it into the collection. I’m excited to collaborate with people who share my passion for Kanye, and want to help build this library. I want fans to have the confidence that anything that makes it into the collection is reputable and high quality. It would be easy to just include “everything” related to Kanye West—there is software available that can do that! What makes this collection great is that it is being curated by a fan, someone who knows what people want to read, watch, and listen to. You won’t find any articles from TMZ or Entertainment News here, but you will find the Yeezus review by Lou Reed, or an analysis of MBDTF by a college professor. It’s important for me to create a collection that enlightens people and offers fans a chance to reconnect with the times, music, and videos that would otherwise be forgotten. Is there anything in the collection that might be new to even the biggest Kanye fan? The Spike Jonze directed short film for 808s & Heartbreaks, We Were Once a Fairytale. It’s out there for fans to watch and discuss, but so many people have never seen it or heard about it, and it’s such an important part of Kanye’s history. It’s not rare because it’s exclusive, it’s rare because it’s hard to find and get to. I want to connect fans to amazing content that they would have otherwise had to have searched hours for. There’s content on there that would be surprising even to the most dedicated Kanye fan, like myself! At the moment my main priority is gathering everything that’s available online right now—if in the future opportunities present themselves to get exclusive content then I’ll be all over it! The release of 808s & Heartbreaks. The Glow in the Dark tour. This may seem like a strange choice since I never actually went to it, but let me explain: the Glow in the Dark tour was Kanye’s first foray into the world of stage production, and the tour has an almost mystical quality about it. Back in 2008, there were no hi-definition cameras on phones, meaning all we have to remember it by is the shaky, bad-quality 30-second videos scattered around YouTube—but even they have the ability to give you goose bumps. I’m planning on making collections on his tours, and can’t wait to do some deep research into this one. It’s hard to explain the feeling I have about the Glow in the Dark tour. It’s that crazy sensation when you feel nostalgic about something you’ve never even experienced. One of the richest and most well produced songs of all time, “All of The Lights” completely won me over when I heard it for the first time in the Runaway video. According to Kanye, it took over two years to produce, a fact that makes the song even more incredible. I think that it is one of Kanye’s most sonically accomplished tracks, and the level of detail that went into the instrumentation and vocals is awe-inspiring. It’s a pop song, sure, but the layers and textures used are so powerful and the lack of samples make it one of Kanye’s most original songs, cementing his reputation as a musical genius. I think that people can identify with Kanye in so many different ways. As an artist, he has so many different layers, each of which appeals to a certain demographic. If you listen to a song like “All Day”, you can see how that would appeal to the club-goers, the fans that like to turn up and go wild. But then you listen to a song like his unreleased “Eyes Closed,” where he asks “where do the lonely kids go when the bell rings?”, and all of a sudden he appeals to the disenfranchised, nerdy music fans that relate to the vulnerable and thoughtful side of him. I think that the beautiful thing about Kanye and his music is how human it is. He changes his mind and opinions frequently; he often doesn’t make good on his promises; he struggles with saying the right thing; his tweets range from the mundane to the inspirational, and he’s awkward and childish at times. But that’s what the fans love—he’s the anti-celebrity, incredibly raw and disarmingly self-aware. No amount of PR management and training can come close to creating an artist who is as honest and relatable as Kanye West.